What a fabulous day for Team GB! Medals for Wiggo, Chris Froome, the rowing ladies and Michael Jamieson (and hopefully some others that I missed). Unfortunately for El Salvador, they've never had an olympian make it to the podium for a medal of any colour - so London 2012 could be a first for them. But with just ten athletes competing in seven disciplines, the odds are possibly stacked against them. The smallest and most densely populated country in Central America, and situated in the Pacific Ring of Fire, El Salvador is home to some stunning scenery (thank you Interweb for sharing this with me) and diverse wildlife which includes many endangered species. The food is heavily influenced by Mexican and Spanish cuisine. This is where I came a little unstuck because yet again, I couldn't find Cassava or Plantain in the local supermarket here in Hicksville. I'd also already tried and blogged about Horchata - a popular drink in El Salvador - courtesy of Wahaca: Mexican Cooking at home. Eventually I happened across a recipe for Pollo Encebollado or Chicken Smothered with Onions. It's commonly cooked in several Central American countries and I picked it because it was something that was simple to do on a work night and - I hoped - would be family friendly. 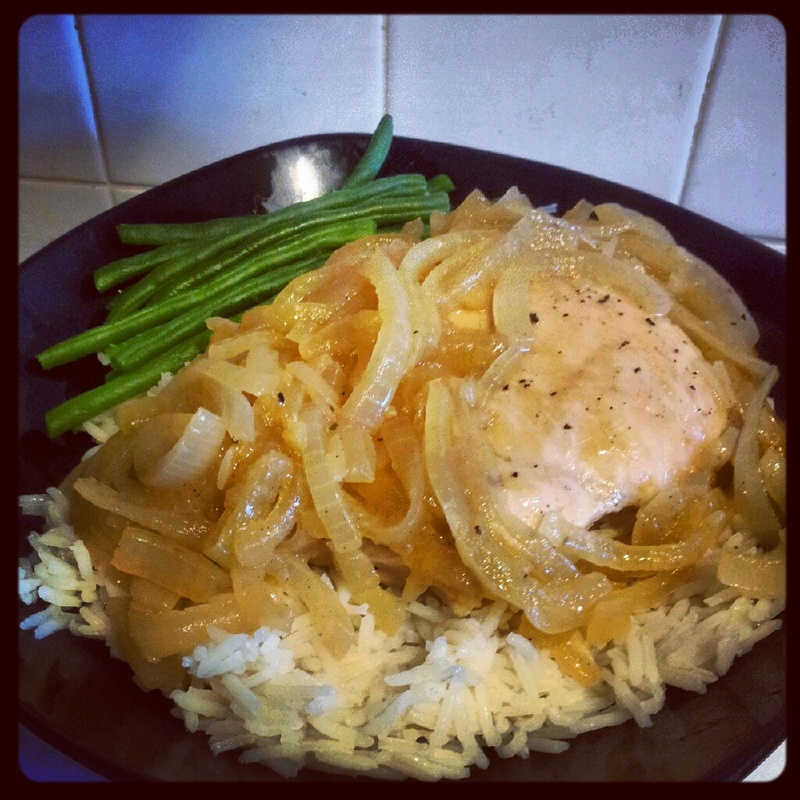 In a nutshell, it's just chicken simmered with onions, stock and wine. Inoffensive, not spicy, just plain and tasty. Of course, I wimped out and let the husband have his usual baked chicken with Uncle Ben's microwave rice and Miss A had scampi and plain boiled rice although she did share my chicken with me and declared it yummy. It's something I'd definitely consider cooking again although it looks a little insipid on plain white rice - I'm sure the husband would be more likely to eat it if it came with a pile of sautéed potatoes. I think this deserves a silver medal for the combination of ease and taste. Well done, El Salvador. Onwards to Guinea Bissau tomorrow!